Something has been bothering me for a while about the Lean Start-up revolution that seems to be happening. It's not so much about Lean Start-up but of some of the interpretations I have been hearing from peers. My inquisitive nature and desire to constantly learn keeps me asking more. The intent of this post is not to disparage a movement that clearly has business value and at a minimum asks people to be responsible for their decisions and not to over-create before receiving feedback. Actually, my goal is to support that movement as a good approach to initial product development by asking some experts in the field to openly consider the effects on Entrepreneur Spirit. This open dialogue to me can only add credibility. One part of Lean Start-up that I have been hearing regularly is that you are "trying" something out before investing too much money into it. This is a natural evolution of some of the concepts we work toward on a regular basis. For instance, the idea of "not following a plan" from the Agile Manifesto, or the experience of a constant feedback loop. Some people have been telling me that a sort of "market trial" is done to see how people will react, and if the response isn't good, the start-up is stopped as being unmarketable and then terminated. This has been a new "change" I've heard as an evolution from something that used to be about receiving early feedback and making appropriate adjustments. I used to hear about "delivering what people want". That has recently changed in tone to "killing something before it starts". Please consider that it might not always be the right thing to do to simply kill an idea because of initial feedback. I am "nervous" about the notion of allowing initial "market" feedback to negatively effect Entrepreneurial Spirit. From what I have read and from peers I have spoken with, it is more about creating as little as possible to get initial feedback to decide what to do next. Awesome! I know that Lean Start-up is so much more, but just as in the Agile movement, there are "versions", I am concerned about an ongoing interpretation of using it to "determine start-up viability". Penicillin, the telephone, and the airplane are ideas that immediately come to mind. The way some people are approaching Lean Start-up as a "kill a product after feedback", these inventions would have never continued into reality. I wonder, with this interpretation, would we have stopped making progress as a society? Imagine if this approach was used for Galileo or DaVinci's ideas? As much as I appreciate the concept of non-waste, I am concerned that people will "blindly" follow a framework that (from some recent explanations I have received) appears to discourage risk-taking at the onset. I believe that entrepreneurial vision should not be ignored. Many entrepreneurs are willing to lose it all for their dreams and to give them a go. Please, do not try to take the entrepreneurial mindset from our society! If an entrepreneur did not have the willingness to risk it all "on a hunch or belief", that same entrepreneur would have a hard time helping other people to share their passion. This blind ambition and drive are an important part of life. Without that drive and only "facts", it would be hard for an Entrepreneur to be willing to risk as much as they do. Perhaps, instead of trying to avoid the risk of failure, we should focus on making it safer for this type of person to take risks. This is after all part of the philosophy of embracing agility. We value failure and learn from it. Actually, we encourage it to some extent. I learned a long time ago that "fear of loss" is one of the greatest anti-motivators to innovation. Needing to test all your hypothesis first and ignoring your vision to what seems to be sort of a "group think" exercise. People who blindly follow this idea will be left short of true innovation. I do not believe this is the intent of Lean Start-up. I would be sad to find that no one ever risks anything anymore as we move forward. Instead of removing all risk, let's focus on helping people to work together to share in the risk or make it less painful for those that have risked and lost. I admire the person who is willing to lose everything for their dream. Shared failures are important to life and evolution. I have done things that I know a Lean Start-up only approach to my ideas would have told me would never work. I know this for sure! Against all odds (and advice), I have been fortunate to have lived in a massive house in the country contrary to what I was told by initial market suggested would happen. I have also lived in my car for the same reason. that others would have said will never sell?". Although I find the concept of Minimal Viable Product to be paramount to removal of waste and absolutely value the prospect of early and constant feedback, I have a personal problem with using the initial feedback to totally kill an idea. Please, let's not turn this truly awesome idea (and the intent of Lean-Start-up ) into something that kills creativity and innovation by accident. I personally couldn't live with myself if I never failed at anything. It keeps me alive and improving. Especially the ones that are willing to fail no matter what others tell them! The following idea is based on experience in several non-perfect matrix environments where the concept of complete organizational change could take many years (or never happen). Does this mean we should simply give into the environment or should work with the existing culture and environment? I am not recommending any changes to the way Scrum (or your Framework of choice) works, but am opening up an "idea" for people to consider. I was recently chatting with someone about the role of a Project Manager in an enterprise Scrum roll-out. Firstly, let me say that having a Project Manager "run" a Scrum Project is something I do not feel comfortable with if the organization is trying to work towards Agility. Let's get that clear right now. That being said, I've helped some organizations (large matrix ones) to introduce Scrum into their environments (including values and principles, not just process) and Scrum has worked out well for them. I still hear from team members that have yearly votes about continuing with Scrum as part of their internally created process. They work their own way and continue with Scrum, don't have PMs running their projects, and decide for themselves how they will organize and work. The organization has made sufficient adjustments to allow this to continue. In Scrum we build a Cross-Functional team of people who can deliver a potentially deliverable working increment. What if the organizational structure does not support this? Do we bang our heads against the wall, or worse (in my opinion); just capitulate and change the framework immediately because our jobs as coaches are on the line? Yes, we are trying to change the way things get done. However, in an enterprise, this takes time. What is not often discussed is that the original organization changes slower than the agile teams will. This will clearly create conflict. 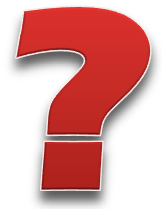 Remember, this slow organizational change is likely part of the "Why" you are there in the first place. See my post about "Why" here. The Agile manifesto says "People and interactions over processes and tools". Well, let me remind everybody.... Project Managers are people too! They have some very unique personality traits and skills that can benefit their teams (especially in Matrix organizations). What would happen if a Project Manager was on a team as a Team Member using their unique skills and abilities to maneuver, build relationships in the matrix organization? The team will have tasks that involve things like "Get marketing to review the content". It's not really an obstacle for the SM to deal with. Remember, the Project Manager (in a traditional organization) has the "keys" to be able to visit marketing in the first place. I have worked with a team having a PO, SM, and simply "Team members". One of those team members was a "person who was a Traditional Project Manager in their past life" who has the rights and privileges in the organization of a Project Manager. For some of you, you may say "No, everything has to change". I say, Yes, ideally, things will change over time. To just say "All project managers must go", is removing a very important skill-set and personality type (I'm not talking about filling out charts) that will be missed in an organization in transition. To expect the organization to just "click the switch" and have other parts of an enterprise org respect the role of the SM immediately is not likely to work effectively. In the scenario I describe, the SM, PO and Team all work together (as expected). In a matrix org though, the PM could be a team member and add REAL VALUE during a transformation. In the process, the PM would also learn some new skills and ways of thinking which could benefit them, the team and the company in the future. You could still be following the Scrum framework (it is not specifically defined as to who can be on a Scrum Team, just that they need to be able to deliver an increment and be a self-directed team). This of course would be transitional, but I may be realistic to expect it to be YEARS in the making as the organization changes to not need the traditional PM role as much and as walls and silos are broken down. Not realizing there needs to be a half way to me at least seems like you are setting up your transformation to fail right from the start. Enterprises don't just turn on a dime. This is why they need a way to "transition" to a new way of thinking. So, consider an experiment; What if you just did Scrum the way it was designed and allowed the Project Manager to take on tasks on behalf of the team as a full-fledged member of the team. They would not have the ability to assign tasks. They would however be extremely helpful and not feel like an outcast. Remember, Project Managers are People too! The Sprint Retrospective and the creation of Trust. I have made previous posts about the importance of the Sprint Retrospective (part of the engagement meeting in Openagile). See... an example here. There is another compelling reason for the Retrospective I have not shared on my blog; The Retrospective's value in the creation of TRUST. We talk about it indirectly through various team exercises and games. I wonder, do we specifically talk about the topic of trust? Many people know the Sprint Retrospective as a time when the team reflects about how they are doing in relation to the Agile Manifesto, how they can improve their skills, how they can better communicate with others, or basically anything to help them "function". I was recently reading Stephen Covey's book "The Speed of Trust" and it got me thinking..... Are we as coaches, Scrum Masters, or Process Facilitators putting enough emphasis on the importance of Trust? Covey has an interesting formula (please don't turn this into a rule for a team to follow), where he factors in a "tax" for lack of trust at varying degrees. The formula simply applies a negative multiplier or "tax" where trust is not present, or a positive multiplier or "dividend" where trust is present for specific topics. If you lack Trust, the game is over. Trust is directly related to the speed that an organization can change or get work done. 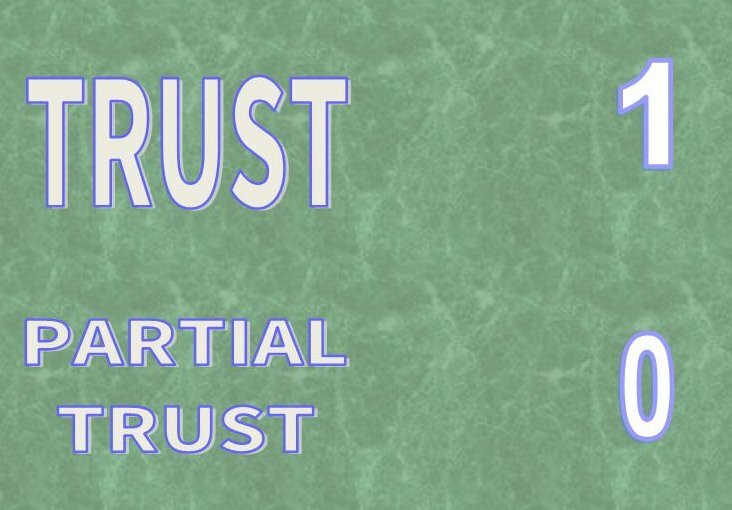 As a result, there appears to be a direct correlation between the level of trust and the cost to the organization. For those of you who are focused on the Lean/Kanban mindset, consider the effect on time-to-market where people are permitted to work based on "trusting them". With some effort, the difference in time to market with or without trust might be quantified. Just a thought. The Agile Manifesto also makes reference to this concept. "Build projects around motivated individuals. Give them the environment and support they need, and trust them to get the job done." The key word here is Trust. Stephen Covey suggests that trust can be created or lost. 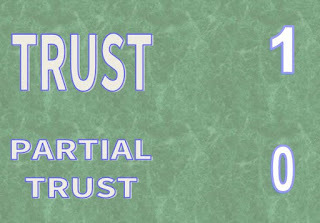 This is a concept I share... more..
During your next Sprint Retrospective, consider having a specific "Focus" on internal and/or external trust if you feel comfortable trying this. It might give surprising results. Managers out there - Be selfish - Remove obstacles. I recently had an interesting conversation with someone about a comment made to a Team: "I removed your obstacle". This may seem like great news on the surface. It appears that at this company, the manager thinks it is the team's obstacle and not their own. The reality is that if a team has an obstacle, although it may not immediately effect the manager, it will impact them. This may be personal or financial. Many change artists know that by showing someone how a change can help them personally increases the likelihood of acceptance. I would argue that if I am a manager, by removing the obstacles for the team, it is actually a form of self-help. The big realization that you are in it "together" is a fundamental mind-shift needed for a manager to switch from "manager" to "leader". By helping my team to succeed, I am actually acting as a responsible leader. For some reason, this message doesn't always come through as being helpful when we share it. Perhaps this is due to our form of communication. We may not be talking in the recipients' head space. Many of us talk about "serving the team", "removing obstacles for the team". Really.. is that what the manager is doing by removing obstacles! Could we imagine they are also doing it for themselves? Do this by removing obstacles for your teams. Please note; This communication has worked well for me to explain the importance of removal of obstacles. It has also caused me some grief. Work out your own way of incorporating this message if it makes sense to you. Scrum exposes problems. It does not fix them. I regularly hear people making statements such as "If we do Scrum, it will solve our problems". The reality is in fact, it does exactly the opposite. Scrum helps to expose problems. In some way, you could view this as purposely creating them. Let me explain.... The Scrum Framework is deceptively simple. If followed properly, it will quickly show impediments to the development process. As work continues, it will expose an increasing number of obstacles. Scrum does not fix a company or a system. The fixing needs to be done by the company, team members, management and leadership. By exposing impediments, Scrum allows the removal of obstacles to the development process. Due to it's time-box nature, it improves the focus of the teams and organization to fix those problems. By removing those obstacles, it allows the team to go faster. Think of a balloon filled with helium with several layers of straps and barriers keeping it down. The balloon wants to climb, but cannot because of barriers holding it back. Some people think that the measure of "velocity" can be used to "push" a team to go faster. This is the equivalent of just pushing harder on the balloon to have it try and force the straps out of the way. In a Scrum context, we realize that pushing the balloon harder to go up when a strap is holding it down only stretches the balloon to it's limits and will eventually cause it to explode as opposed to climb. Work to remove the straps holding the balloon back, and it can be free to climb. As the balloon climbs and more barriers are removed, it can start to move at it's natural rate (flow). The problems Scrum expose need to be addressed. Only then can the performance of the team increase. If Scrum shows you something that is hurting the development process, you need to adjust the process to remove the delay to the team. Having the team changes its' way or worse; trying to change Scrum so you do not have to deal with the information, only serves to allow the straps to remain secure. Trying to adjust Scrum to allow the "straps" to stay in place and just keep pushing will not fix the problem Scrum has shown. What is intended is the direct application of pressure to remove the obstacle. Please don't tell people that Scrum fixes problems. Remember, Scrum exposes them. I recently woke up in the morning after thinking most of the night about how to help two new internally appointed Agile Coaches to become more effective in their organization. The new coaches were unable to cross the "history vs. future barrier". 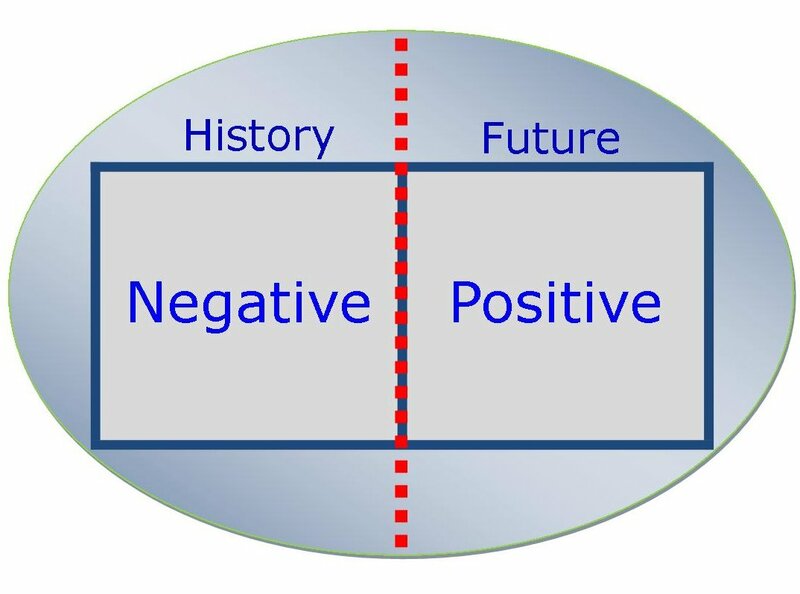 In other words, they had a habit of "rewinding the past negatives" instead of crossing the line to "talk about the positive future". This was caused by years of history where they work. This morning it hit me (quite by accident when reviewing and old post). We should remind them directly that they will be Coaches, and with Coaching comes a certain level of Responsibility.... One of the biggest responsibilities is the one to be Positive and find some light when things look bad. Of course, sometimes directness and brutal honesty are needed, but let me not get diverted.. Remind the new coaches that "being negative" won't help their team and is inappropriate for them. Caution! If handled incorrectly, it could appear that you are asking them to be untruthful... this is not the intent. You could ask them; "Do you think telling the team there is no way they will complete the project on time over and over again is something a coach should be doing?. How do we know there aren't people on the team who feel differently? Do you think it's good for morale?" Personally, I might explain that the Mental Energy for everyone could be put to good use in getting the first Feature out the door. There is of course (a given) the need to report important information to the company and be truthful, but that doesn't say anything about the need to be negative. To me, it's more about negativity. If the people who are supposed to be motivating others are constantly saying it can't be done, well.. probably, it won't be. The fact is, we are using an Agile Framework and we BETTER be delivering value after 1 or 2 Cycles or a different discussion needs to happen. I would explain that.. hey.. the reason external people are so aggressive is that they don't see anything until near the end of the project... change the visibility and tone of information and the aggressiveness will eventually go away. Focus on what's important.. Helping their teams deliver value (and quickly) (not as in push them but focus on value delivery). At the same time, an improvement in the External communication or information radiators will surely help. If Information Radiators are maintained with care, professionalism and are truthfulness, teams will not NEED to tell anyone they won't make the "complete scope". The information shown will allow the management to be part of the "solution" and will significantly reduce stress for everyone. I thought it might just share my thoughts about this for those that are interested. Agile coaching is a big responsibility. 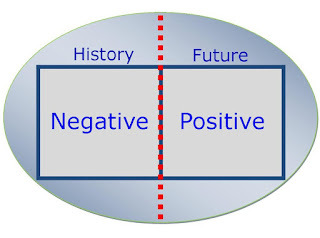 If you are learning to coach, you must learn to leave the Negative Past behind and focus on the Positive Future.